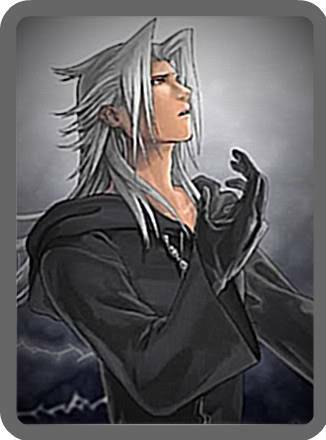 Xemnas sighed, "It matters not, I lack everything to make anyone feel anything. I'm utterly useless." He looked out the window in a dazed fashion. "I wish to be complete again Kingdom Hearts, I wish to be human once more." Aerith looked at Xemnas in surprised. She hadn't heard this before. So Nobodies really did have dreams. She never would have thought of that. "I know you don't like me, but My Melo will work hard to become someone you love and to make your dream come true." "That's very sweet of you," Aerith said, smiling down at My Melo. "Would you like some more cake?" Xemnas stared at My Melody then sat down across from her, "You don't seem to understand, I was human, I cannot be human now, I lack emotions, I cannot love you, or anyone for that matter, even if I desperately wish it so." His thoughts lingered on a certain blue-haired berserker before flickering back, "It is easy to have dreams, they are just memories from my past self, nothing more." Aerith shook her head at Xemnas's comment. That was a total lie, and he obviously didn't know it. "I saw how you looked at your friend earlier. If that wasn't a human emotion, nothing is." Xemnas looked startled at this, he frowned, "Number VII is my second-in-command, nothing more." "Of course, Xemnas. Just keep telling yourself that," Aerith replied straight-faced. "Though think of it like this: maybe you don't have a heart figuratively rather than literally. Maybe you acknowledge you feel something and you'll realize you do have a heart." After all, someone without a heart couldn't look at people like that. Xemnas blushed lightly, raising an eyebrow, "Are you saying I have feelings for Number VII? Even though I shouldn't?" "You have a dream," She said smiling, "I finally have your note. My Melo thinks that you shouldn't think that just because something or someone told you, you can't, doesn't mean you should believe it." "I think My Melo's right. If you didn't have a heart, you couldn't have a dream. And I think you do have a thing for Number VII." Xemnas frowned, "Even if that is so, I can do nothing about it. I am the head of an Organization of evil-doers, who are mostly men, my colleagues, who would lose all respect for me and for Number VII." "Dude, I was a rebound for a guy who's 'best friend,'" she used air quotes, "got killed. People still respected--and feared--him even after that got out." Xemnas rolled his eyes slightly, "Was your friend another girl? No. The situation is a bit different. They already make jokes about him being my lapdog, what if it was true? " "He was definitely a 'he'," Aerith said. "Though we did dress him as a girl once." Xemnas sighed, "Well your friends must be more open-minded than my Organization." "I think," Aerith said, "your Organization would respect you more if you would just admit it rather than lie to yourself. Who knows, they might realize the whole group was wrong about the lack of hearts." Xemnas rolled his eyes, pouting ever so slightly and crossing his arms, "I could attempt. I do not think it will go over well." He imagined 11 members laughing at him during a meeting and he shuddered. Aerith glanced briefly over at Demyx, who was fussing with table clothes or a vase of flowers. "I don't think he's quite straight either, if you ask me," she whispered. "So um, My Melo, where are you from?" "I come from Mari Land! A land that only exists because of human dreams!" "It sounds like a wonderful place, if exists because of human dreams," Aerith commented, smiling. "You would love it there. It's filled up with the prettest flowers in the world," She said, "It's a world full of happiness, music, and of course all of my friends." "It does sound like a beautiful place. I wish I could go sometime." "It looks like Mr. Wagon is doing a good job," She said looking at Aerith, "It brought in a customer." "Excuse me miss," She said approaching her, "Do you work here? I'm actually looking for something to eat. I found this flier and decided to stop by."